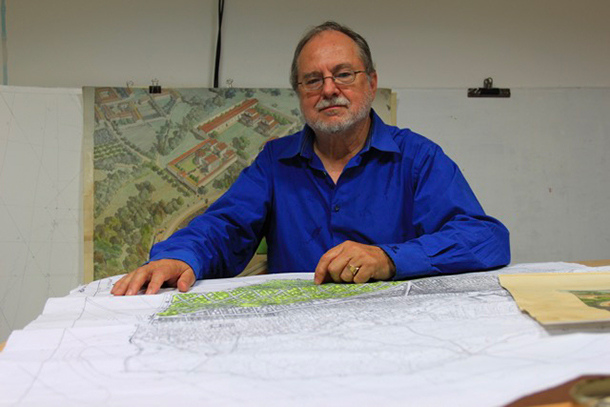 Jean-Claude Golvin is an architect and researcher, Emeritus research director at the CNRS (National Center for Scientific Research) and specialist in visual reconstruction of ancient cities. His reconstructions are well-known to the general public, thanks to books such as Voyage en Gaule Romaine (“Travel to Roman Gaul”, in collaboration with Georges Coulon, 2002) or, most recently, Hérode, le roi architecte (“Herod, the architect king”, in collaboration with Jean-Michel Roddaz, 2014), as well as his watercolors, which have been exhibited in many archaeological museums. He is familiar with the world of comic books, and even plans to embark on an illustration journey himself. Let us look back on his career.